Started the day not so early after a pretty good sleep (P put the inner in shelter) So pleased to get back to sleep after a wee. It really poured rain overnight, but not a drop all day since. So thankful! The boys headed off and then we got going about 30 minutes later. Nice cool day and we essentially kept our jackets on all day. Headed off at a good pace, up and down and up and down the scrubby sand-hills. 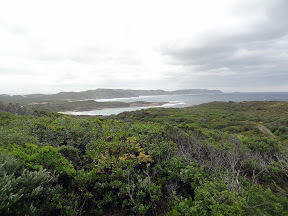 Terrific views of swamp and coast. 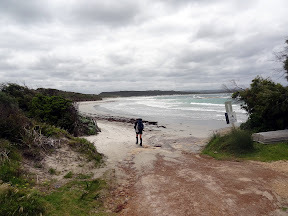 Left Boat Harbour campsite with breezy, overcast sky and hoping the leaden skies would not drop their rain on us – yesterday was very fresh in our minds – and boots and socks!! We'd wrung out the socks when we got to camp and hung them in the breeze; removed orthotics and upended boots to help drain. Overnight I put my socks (the longest to dry) between Keren's travel towel (like a body chamois) and under the tent (in the shelter) and slept on it all night. By morning they were just damp – so a good result. Though putting them on didn't feel great, and putting your not feeling great feet into damp / wet boots didn't feel good! Thankfully it doesn't take long for the feet to warm the socks in the boots, and then they feel better... AND it didn't rain all day, so they felt pretty good by the end too – a little pruney though. Boat Harbour delightful small beach. Then onto another all easy walking, then up and over. Felt very tired by morning tea and took a couple of extra lollies to get me going. 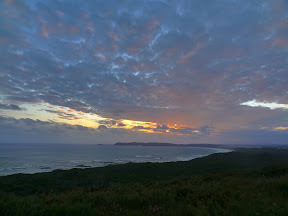 By Hillier's Lookout was feeling a bit better and P suggested Caravan Park at Parry's might have coffee and ice-creams. Quite a happy thought and down we headed. A much bigger caravan park than expected and we went to the caretakers and the lady there didn't sell tea, coffee or ice-creams, but when I asked she said she had 2 chocolate wedges in the freezer and we could have them. P was edgy, but I realised she really wanted to and she refused payment. Told us their friend Frank and Jan were going to have them last night, but they were too full, so she was pleased to use them up as they needed to make room in the freezer for fish they will catch. She and her husband are volunteers who come from Perth twice a year for 4 weeks. Shire owns site. They've been coming for 51 years to camp and so have Frank and Joan. Anyway, we ate our ice-creams and now have chocolate on our shirts! and she was very happy to chat. We bought two ice-creams from he Parry Beach caretaker for a good chat. They were a little over priced, but she was such a lonely lady. 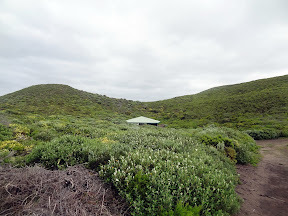 Not sure if all the volunteer caretakers do this, but she said she'd give any Bibbulmun Track walkers a cup of tea and cake if they called in and the kettle was on (which I think it usually was). 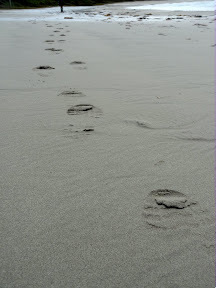 We then got on our way onto the beach (firm) and up to the inlet. Boots off to wade in ankle to shin deep water, as the inlet was running. Tide was beginning to go out. We continued on in bare feet and beech was really firm. Could see the boys wending along ahead of us. Hit some soft sand about 3/4 way along and stopped for lunch in a very comfy sheltered spot. The inlet was running out quite strongly with dark, rich, tanniny water. Had lunch sheltering under a limestone cliff. We were very thankful we weren't doing Mazzoletti Beach yesterday in that gale: it was windy enough in today's breeze! We shared our lunch spot with a hopeful seagull, whose hopes were never realised: we feel we need all our sandwich for the afternoon! 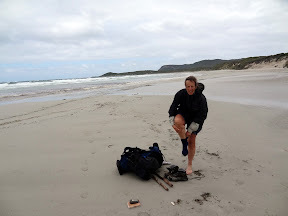 Put our boots on at this stage and they felt great and it felt like walking was easier, then we were onto firm beach again and off we went. Mazzoletti beach with hard sand was like Maserati Beach; but with soft sand it was like Mozzarella Beach – the many faces. The diversion wasn't too bad, but the last walk up Tower Hill often on loose sand was arduous. Thankfully 4WD rubber was down for hardest pasts and I must say it did help but also it was most worth it when we got to the hut. After getting to camp, unpacked and got our damp bits out to dry and tried to get some more charging on the FUSE. Encouraged by the Guidebook's "View from the rocks on the South-West rim of the hill, not far from the shelter, are spectacular", wandered up the hill to view the spectacular. The shelter really is nestled into the hills! The time spent alone together was a wonderful, energising salve; which seems odd to say after spending the day alone on the track; not sure if the end of the walk is producing its own tension, or the approach of another town? We're hoping, and planning, for a good outcome from Denmark, and will leave as early as possible tomorrow morning to make sure we've got enough shopping time available. We're not really looking forward to the Caravan Park: of all that we dropped our parcels off at, it impressed the least – I think it looked too touristy and polished. Bid the YHA boys farewell, as it was possible that we'd not see them again, and snuggled down into bed: very happy that the NeoAirs do such a good job on these hard timber floors. 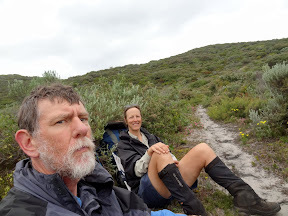 Over the 54 days of our trek, we took a portrait photo each morning before setting off on the day's walk and then each afternoon when we'd reached camp – often capturing the morning's optimism and then the afternoon's pain of the journey on our faces.